(Newser) – Stocks are closing lower, dragged down by weakness in retailers and energy companies. 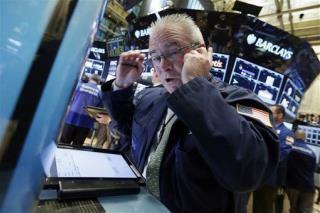 The Dow Jones industrial average fell 56 points, or 0.3%, to 17,702 Wednesday. The Standard & Poor's 500 index lost six points, or 0.3%, to 2,075. The Nasdaq composite declined 16 points, or 0.3%, to 5,067.
like reading an article on the books or points in Vegas.